The challenge for Day Three of the Worldbuilding bloghop is to describe the religion and/or magic in your world. There are two rival factions of gods—the Stronni and the Taaweh—and the type of magic practiced by their followers differs. The Stronni themselves worship the Perfect Order, which is somewhat like the Norse concept of wyrd or fate. They watch the stars for omens and guidance, and attempt to divine the path the Perfect Order wishes them to follow. By doing so, they believe that they will be guided along the path of least resistance to achieve their goals. The Stronni pride themselves on their ability to be rational, while at the same time they are ruthless and often pitiless to those who displease them. The Stronni live high up in the mountains and humans are forbidden from venturing into the mountains or the foothills. Those who do are never heard from again. When the gods are particular angered, they cause immense balls of fire to rain down upon the valley. They are not evil, but they are very strict and demand obedience and discipline from their subjects. The Stronni demand that the humans build towering cathedrals in their honor, with large circular openings in the tops of the domes to allow the Eyes to see down into them. Only when it rains are tarps permitted to be drawn across the metal arches that crisscross over the opening. A priest of the Stronni is called a caedan, after the Stronni king Caednu. (An acolyte is called a tadu, which is the Stronni word for “boy.”) The caedan have little magical ability beyond lighting small ceremonial fires for services or lighting the incinerating blazes of funeral pyres. The caedan believe that they are promised a position of honor in the Great Hall of the Stronni after death (see below). In true “sun-worshiper” fashion, the Stronni males are always naked and their bodies are works of art, perfectly formed and decorated with glistening magical tattoos. The caedan emulate the gods by wearing nothing more than a golden loincloth and decorating their bodies in similar tattoos. They are permitted to wear cloaks in cold weather. However, as imperfection displeases the gods, tadu and caedan are required to remain physically trim, at least until old age renders them unable to do so. Sorcerers dedicated to the Stronni are called vönan. They are exclusively male, as are the caedan, and specialize in fire magic and magic involving air. They can cause massive destruction with firebolts and windstorms and they have the ability to fly. It isn’t permitted for a vönan to be trained, unless he is attached to a noble house, and they are often used as weapons in battles between city-keeps. Like the caedan, vönan have magical tattoos that mark them as “owned” by the gods—in this case, just a single tattoo of an eye on the top of the skull, which must be kept shaved. As we see in book two (available in March), this tattoo fades away, if the magical link to the gods is broken. Stronni magic must be invoked through chanting, so it is possible to disarm a vönan by preventing him from speaking. Female Stronni are treated respectfully, but not equally. They are required to wear gowns that keep most of the body covered, though diaphanous materials are permitted, and this is reflected in the culture of the humans. Still, they do have power. The queen of the Stronni, Imen, is a powerful sorceress, and women dedicated to her have the ability to see anything in the world illuminated by the Eyes. They are called ömem, and they are the spies of the kingdom. They also have the ability to cast healing spells to a small degree. Generally, they mix up herbal formulas and link the spell to the potion. Because of their abilities and their control of the elite assassins known as samöt (see yesterday’s post), the ömem are treated as untouchable. They have no political allegiances and will sell information to the highest bidder, unless it pleases them to make a temporary alliance. Not even the emperor dares punish an ömem for supplying information to an enemy, for fear that the Sisterhood will send the samöt after him or deny him information he needs in the future. The Great Hall of the Stronni is where caedan believe they will reside in the afterlife, but this is, at best, a misunderstanding. Where this misconception arose is uncertain, but the Stronni themselves never specifically promised this, nor do they have any ability to grant an afterlife to the men and women who worship them. However, they have no desire to disabuse their worshipers of this misconception, since it serves their goal of bringing order and perfection to the humans. Peasants and farmers care little for the Great Hall, since they have no expectation of being anything more than servants there. The Taaweh were the original gods, before the Stronni attempted to drive them out. They chose to disappear a thousand years ago, when they saw their human charges being driven to extinction by the Great War, but they have merely lain dormant. Their worship didn’t vanish entirely, but the offerings left for them at sacred pools and the ruins of their stone circles have become little more than blind custom and superstitious attempts to gain blessings from unknown spirits. The name Taaweh is similar enough to the Stronni word towe, which means “small,” that the misconception arose that there were tiny people living in the forests and streams. The Taaweh have little structure to their society. All are treated equally and in fact they have no names and no word for “I”. When a Taaweh wants something, she is likely to say, “It is desired that….” rather than “I want….” Only two Taaweh have names: the Iinu Shaa (“Beloved Lord”) and the Iinu Shavi (“Beloved Lady”). The Iinu Shaa is a frightening figure. He is taller than a man and has two faces. One face looks like a handsome man, but as a corpse, bluish and waxen, while his other face looks even more corpse-like, with blue-black skin and lips drawn back in a grimace from shrunken gums and elongated teeth. The first face is called the Iinu Shaa‘s “kind face,” whereas the latter is called his “fearsome face.” Both faces have hollow eye sockets in which can be seen a black so deep that it appears to be endless. The Iinu Shaa wears mismatched pieces of armor taken from the battlefield, damaged and bloody, and it is he who comes to collect warriors who die in battle. The peasants long ago distorted the name Iinu Shaa into “Neesha.” If a warrior has been noble and virtuous, it is said that he sees the “kind face of Neesha” coming for him as he lies dying. If he has been malicious or cowardly, they say that “the fearsome face of Neesha” will come for him. Though what happens after that, nobody knows. The Iinu Shavi is the opposite of her consort. She is fair and beautiful and so full of life force that she positively shimmers. It is impossible to kill her, as it is impossible to kill any of the Taaweh, but she is bound to the earth. If she is separated from it, she loses strength. Imen was clever enough to figure this out and arranged a trap for the Iinu Shavi, in which the old Great Hall was magically lifted above a deep chasm, while the Iinu Shavi stood in the hall, attempting to arrange a truce. The Iinu Shavi fell unconscious and there she has remained, imprisoned, for a thousand years. The Stronni built a second Great Hall for themselves, leaving the first to serve as a tomb. Koreh stretched out his other hand and cupped it, then tilted the pitcher until water began to flow into it. But the water never touched his skin. It pooled in the air above his palm until he stopped pouring and set the pitcher down. The water hovered above his outstretched hand, oscillating slowly back and forth until it settled into the shape of a globe. Koreh held it up for Sael’s inspection, grinning triumphantly. Sael took a couple steps forward and reached out to touch it. Where his finger tapped the surface of the globe, ripples moved outwards as they would on the surface of a pond. But the ripples continued around, converging on the back of the globe to create a shadow of a fingerprint there, before bouncing back to the front. “It doesn’t seem very practical,” Sael said skeptically. “Well, just wait until I get better at it.” Koreh focused his attention and the globe began to flatten and expand until a hole opened in the center, making it resemble a wheel. Koreh caused it to rotate a few times before letting it return to the globe shape. Then he made the water elongate into a tube with a wide bulge at the base, until it so obviously resembled an erect phallus that Sael gave a startled laugh. Koreh smiled and dumped the water back into the pitcher. He’d seen one of the Taaweh explode a ball of water into mist, but he doubted he could do that without getting them both drenched. Unlike Stronni magic, Taaweh magic is quiet and doesn’t require anything to be spoken. It all takes place in the mind. This has been an extremely long post, but tomorrow’s should be shorter. 🙂 And then we’ll finish up on Friday with an excerpt! Three thousand years ago, this kingdom was home to humans who worshiped the Taaweh. I’ll be giving more information about the Taaweh tomorrow, but for now let’s just say that they were the original gods. Then a rival tribe of gods called the Stronni moved into the valley from the northeast and declared war. After two thousand years of fighting, much of the valley had been laid waste and the human civilization had been reduced to small bands struggling for survival. The ruins of the ancient keeps were rebuilt and walled cities grew up around them. These were ruled over by warlords known as dekan. The dekan vied for power for several centuries, until the warrior king Khemed united what would later be called the West Kingdom, from the Great Chasm to the ocean, and forced the most powerful dekan in the east to pay him tribute. He proclaimed himself emperor and the Old Empire was born (though of course, it was merely “the Empire” at the time). Several generations of emperors followed after Emperor Khemed. The empire expanded to include the East Kingdom, roads were built to connect the city-keeps, and the Emperor Salekh Bridge was built to span the chasm. This both facilitated trade throughout the empire and strengthened the emperor’s hold on the East Kingdom. It was the great achievement of the empire, along with the great temples built to honor the Stronni. About a hundred and fifty years after the death of Emperor Khemed, Emperor Agrehn foolishly attempted to imprison the ömem—women dedicated to the Stronni goddess, Imen. These women possessed the ability to see through the Eye of Atnu by day and the Eye of Druma by night, and they provided their services to the emperor and the rulers of the city-keeps for extravagant fees. Agrehn thought that he could force them to serve only him, but the ömem retaliated against him. They chose the best of his guards and promised them great power, if they would swear to serve the ömem and betray the emperor. In one bloody night, Emperor Agrehn and all of his most loyal nobles were slain, and the samöt came into being—a deadly brotherhood of assassins magically linked to the Sight of the ömem. For centuries, the empire was subject to internal conflict as emperors rose to the throne, only to quickly fall to coups or assassination. Then in the eighth century after the Great War, the Salekh Bridge collapsed under disrepair and effectively cut off the East Kingdom from the capital, gü-Khemed, on the western shore. The emperor was forced to appoint a regent in the east. The vek, as the regent was called, soon became immensely powerful in his own right. Though the dekan have diminished in power over the centuries, they still rule their respective city-keeps (known as tondekan), paying tribute to the emperor in the west, or the vek in the east. The Kingdom of Dasak is now effectively two kingdoms and civil war is threatening, as tension mounts between the emperor and the vek. 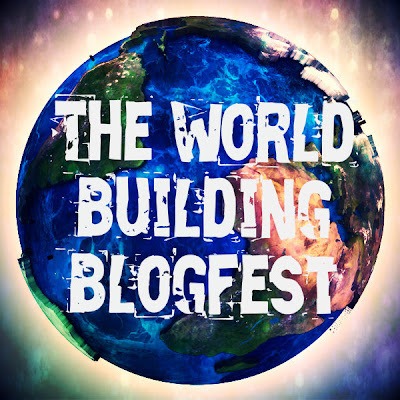 This week, I’m participating in a fun idea for a bloghop that Sharon Bayliss came up with: to blog every day about a different aspect of the worldbuilding you’ve done for a novel (or series of novels)! The challenge for Day 1 is to describe the geography and climate of your world. The world I’ve chosen to describe is the Kingdom of Dasak from my Dreams of Fire and Gods trilogy. 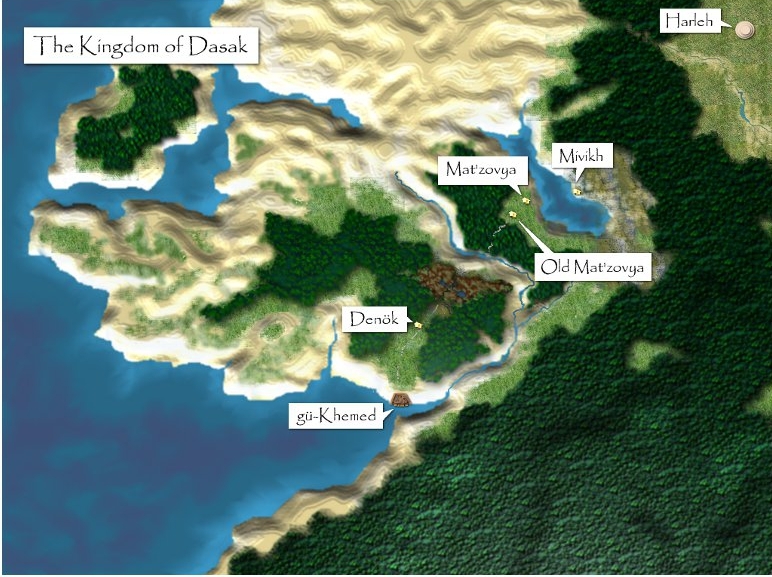 The Kingdom of Dasak is much like medieval Europe in terms of climate and the types of vegetation and animals one might find, though it is just a bit different, inhabited by creatures like the ghusat and the ten’nak (described below). The trilogy takes place in late summer and early fall, so the nights are growing chilly, but it is still possible to camp outdoors without much hardship. Winters in Dasak are moderate, but they do have snow. The kingdom occupies the basin of a large valley, bordered by mountains to the north and uncharted forests to the south. The capital is on the southwestern shore, beyond which lies a vast ocean. To the extreme northeast of the valley lies a trade route to other kingdoms that few in Dasak have ever seen. There are many more cities and villages than those labeled on the map. Those are simply the ones Sael, Koreh and Geilin come across in their travels. Old Mat’zovya used to be Mat’zovya several centuries before the bridge collapsed. But the accumulation of silt over time caused the lake to retreat from its boundaries, causing bogs to form on both the eastern and western sides. In the east, the bogs are still there, causing the route from the lake to the forest to be treacherous. A path through the bogs is marked by small stone obelisks, but they can be difficult to see in the mist that tends to settle there. On the western side, the bogs eventually dried up and became fields. So the city was relocated to remain near the shore of the lake. The old town was allowed to fall into ruin and is now the home of wayfarers, thieves and cutthroats. The circular walled city of Harleh, which can be seen in the northeast, lies in the middle of a large flat plain called Harleh Plain. This was once a great forest, but the Great War of the gods, a thousand years ago, laid waste to it and the ground was so tainted by foul magic that nothing would grow there for centuries. Now it is miles of gently sloping hills covered in grass and shrubbery. However, at the end of Dreams (the first book of the trilogy) this all changes, and the ancient forest returns once again, springing up almost in an instant and surrounding Harleh. The mountains are home to the gods known as the Stronni. These are forbidden to humans and no one who wanders into them is ever heard from again. It is best to avoid even straying into the foothills. The Dead Forest is a place entirely held together by magic. Nothing lives there. The trees are dead, the water is rank and stagnant, and there are no insects. The only “animals” there are the wretched demen — walking corpses comprised of parts of animals that wandered into the forest and died there. Occasionally one might kill a human and the next time someone reports seeing it, it may have a human arm or head attached. Lake Zovya is home to a species of enormous aquatic serpent with a head bristling with horns, known to the locals as a ghusat. They keep to the deep waters, so fishermen prefer to keep close to shore, unless it is necessary to cross the lake. Fisherman will charge a considerable sum to transport someone across, because ghusats are known to destroy boats. In the bogs on the eastern side of Lake Zovya, one might come across a ten’nak. These are a species of plant which feed off the life force of passing animals or humans that drown in the bogs. What makes them dangerous is their ability to affect the mind and make a man think he hears a voice calling from a certain direction, or that he sees a friend waiting for him. Before he realizes, he may find that he’s strayed out onto the shifting “ground” of the bog, where he soon falls through to drown in the underlying muck. Dasak is looked over — literally — by the sun and its single moon. According to legend, the Stronni goddess, Imen, plucked out the eye of her husband’s faithful manservant, Atnu, and threw it into the sky, where it became a ball of blazing light, watching over the land by day and reporting everything it sees to the gods. It is called the Eye of Atnu. She then plucked out the eye of her own servant, Druma, and this became a light in the night sky, spying on the land during the night. But Druma is elderly and unable to keep her eyelid from drooping. So once a month the Eye of Druma is fully open and once a month it is fully closed. Anything touched by the light of the Eyes can be seen by Imen, so those who wish to remain hidden must keep to the shadows. I hope that was an interesting look at the geography and environment of the kingdom. Tomorrow, we’ll be looking at its history and political system! Jamie Deacon just reviewed Dreams of Fire and Gods: Dreams and had some great things to say about it! 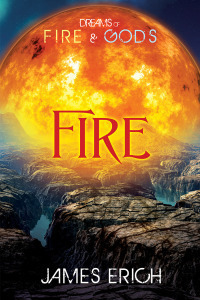 I’ve just received the finalized version of the cover for book two of the Dreams of Fire and Gods trilogy (called Fire). I absolutely love it! Of course, it had already been decided that the artist (Paul Richmond, who also did the cover for Dreams) would try to keep the basic thematic elements of the first novel, but he did a terrific job and I’m very happy. For Dreams, Paul symbolized the overall theme of a battle between gods of fire/light and gods of darkness (though, I should point out, not exactly “good” and “evil”) by giving us the striking image of a sun and moon merged together. Since we see the gods of darkness much more in Dreams than we do the gods of light, the color scheme of the cover is still largely blue and dark, with clouds to symbolize the idea of dreaming. In this novel, the gods of fire make an appearance, so Paul gave us a sense of the sun rising over the barren mountains where these gods dwell. I can’t wait to see what the final novel cover looks like!